Companies need insights on how the landscape is evolving and where disruption is likely to occur. Digital Transformation, Internet of Things, and “Anything-as-a-Service” are just a few examples of disruptive forces creating new business value and opportunities for growth. Investment Banks (IB) are facing stiff competition from boutique firms and in-house corporate development teams. Improving sector specific coverage with deeper insights provides the basis for more compelling Buy-Side and Sell-Side propositions to clients. Private Equity (PE) firms want to maximize proprietary deal sourcing which requires a thorough bottom up research driven approach to support investment decision process. Creating a high volume of proprietary deals that capitalizes on sector expertise is a key driver of profitability. Inorganic strategies have become an important component of corporate growth. We enable corporate development programs setup a disciplined process for articulating strategic gaps to means for filling them through sourcing and structuring deals and ultimately managing the integration process. We support clients through the deal life cycle - from pitch to execution across sectors, products and geographies. We provide thought leadership and analysis around industry dynamics, trends, disruption and business models. Our capabilities offer intermediaries (IB and PE) and strategic acquirers an edge with up-to-date understanding of market landscape and disruptions. We leverage our proprietary platform to track disruptions and ecosystem activity. Our systematic bottom-up approach for market mapping, trend analysis and identifying business model disruptors enable us to build the investment thesis. 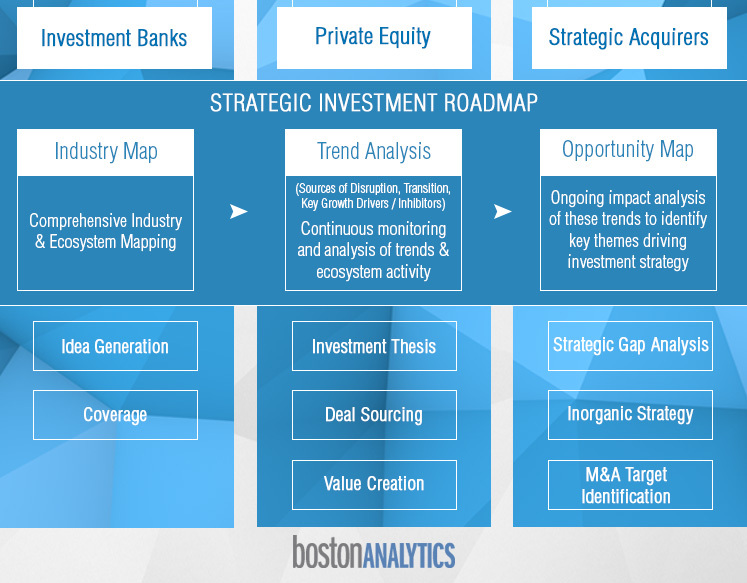 Strategic Investment Roadmap: Analysis of competitors and other players (with similar business models but perhaps selling different products and services), in order to benchmark performance, stimulate new thinking, identify pivots, and set expectations regarding return on new initiatives and investments. Opportunity Identification: Identification of the long list of potential partners based upon the investment ideologies, establishing a short list of potential targets, profiling of the target investments. Opportunity Mapping & Analysis: Analysis of the ever changing industry dynamics and identification of the challenges as well as opportunities to ensure future sustainability.